This article is part of a special series called "The A-Z of Marathi food". India is the land of diversity. Each of the 28 states in India has a unique cuisine but the Indian food served in restaurants represents only a tiny fraction of our culinary heritage. I come from the western Indian state of Maharashtra. Capital: Bombay (Mumbai). Population: 96 million (only 11 countries in the world have a population higher than Maharashtra). Language: Marathi. Traditional Marathi food is earthy and humble, diverse and very tasty. It also remains relatively unknown to non-marathis. Its time to change that. I invite you to join me on an alphabetical culinary tour of my state. We will go through the letters A to Z and make a dish with each letter to show-case Marathi cuisine. Moving on to "W", I knew there was but one thing I wanted to make. A meal that embodies simplicity and humility. After weeks and months of eating spicy curries and using recipes with complex spice mixtures, our palates need a break! The food that babies and toddlers are fed all over the world has many common attributes: it is bland, mushy and nourishing. As we grow up, our tastes mature and it is exciting to try different flavors, spicy and exotic. But every so often, especially in times of crisis and stress, we find outselves craving that primeval mouth-feel of comfort food. This comfort food has different versions all over the world. It might take the form of small pasta shapes dressed simply with butter and cheese...the simplest form of macaroni and cheese. Or peanut butter and jelly. Or chicken-noodle soup. In Marathi food, that simple comforting dish is Waran-Bhaat. Waran is a the simplest form of dal. In my grandmom's version, toor dal (split yellow peas) is cooked to mushy goodness, then mashed up and dressed with some curry leaves and a sprinkling of salt and turmeric. This dal is served with some fresh steamed rice (bhaat). 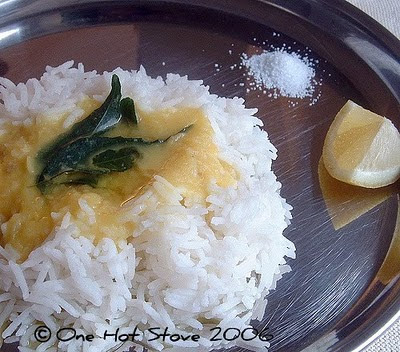 The duo of the dal and rice is eaten with the mandatory dollop of ghee (toop), a wedge of lemon (limbu) and some salt (meeth) on the side. Thus we have the glorious platter of Waran-Bhaat-Toop-Limbu-Meeth, the magic words that transport the Marathi soul to simpler times. On one of those inevitable days when you feel harrassed and stressed out, a bit under the weather, and the thought of eating a full meal is too unappetizing, try this simple meal. It is designed to lift the spirits and make you feel like all is right with the world again. Waran-bhaat is also the first course in the traditional meal served at Marathi weddings. You eat a small amount of waran-bhaat before moving to to the rich festive dishes. Maybe it is a symbolic recapitulation of our taste in food, or just a tribute to this simple and delicious food. Note: I know that what I am spelling as "waran" should technically be spelled "varan", but you will let that one slide, won't you? Soak the dal for 20-30 minutes. Rinse several times, then cook (on stove-top or microwave or pressure cooker) till the dal is completely cooked. Use the back of a ladle to mash the dal into a coarse pulp. Add salt, turmeric and curry leaves and enough water to get the dal to the desired consistency. Bring to a boil and then turn the heat off. Meanwhile, cook the rice till tender. Ladle the dal onto a mound of rice, with a dollop of ghee on the dal. Serve lemon and salt on the side, to be mixed in as desired. If you want to include vegetables in this meal, any simple stir-fry will do. Classic combinations include waran-bhaat with pan-fried potatoes or cabbage stir fry, and waran-bhaat with a milder version of matki usal. If tomatoes are in season, serve some fresh sliced ripe tomatoes with waran-bhaat for a special treat. The important thing is to eat this meal right after it is cooked, while it is steaming hot. In Marathi, the term for freshly steamed rice is pahilya vafecha which means "of the first steam" and this kind of rice is considered nothing short of a delicacy! Hope you enjoyed this palate-cleansing food! We shall meet soon for another wild-card letter, the mysterious "X" of Marathi food. I remember the little game a maharashtrian neighbour used to play with me when I was little...(designed to tickle me to make me laugh in the end)...It started with "Waran Bhat Bhaaji poli, kadhi...."
hi. oh remember the umpteen times we made waranbhat in just 5 times in my v efficient cooker? we wd go in the kitchen only at 8.45 pm and start dinner at 9 pm . you can add a little hing to the waran too, so it is digested better. 1 more classic combination is waran bhat bhende , fried ladies fingers which you,ve already shown earlier on yr blog.all the best for x. you can read x as ksa as in x ray or as jha as in xylophone. luv, yoma. This looks so simple and comforting. Thanks for sharing! Nupur, I think it's a better idea to first rinse the dal and then soak it for approximately half an hour. That way we do not lose the water soluble nutrients from the dal. Since on nutrients, I'd also like to add that Vitamin C in the lemon juice helps the body absorb iron from the dal. Since the everyday food in Maharashtrian homes is mainly vegetarian (most of the the 'non-vegetarians' having meat and/or fish only on Sundays or holidays), it becomes important to get as much iron as possible from pulses, lentils and vegetables. I also support Yoma's suggestion of adding asafoetida (hing) to the dal for more flavour and better digestibility. Hi Nupur, it's me again. I made your 'Tuesday soup' last night. (Well, it was Tuesday eve anyway :) My hubby was away on tour and it was just my 15-month old daughter and me for dinner. I didn't feel like cooking a lot and fancied making just one dish which would suit both of us. So I made this soup of yours and it was great. It was so easy and very quick to make (also because I put all the veggies in the pressure cooker). My daughter loved it. I added half a can of corn kernels for natural sweetness because she likes her food to be a little on the sweeter side. But even with that it tasted fantastic. I'm sure it's gonna be one of our favourite dishes. Thanks a lot. By the way, just like the 'v' marking on recipes, you can also think of marking them with a 'b' for 'suitable for babies'. This soup and your 'Sunshine Oatmeal' can already be marked. What say? AA, I remember that game too!!! Hi Yoma and Vaishali, excellent tips as usual! Sailu, yes, plain toor dal is a treat once in a while! Vaishali, I'm so glad the soup tasted good! I'll think of making a kid-friendly category soon. This soup is an excellent partner with some pulao for a complete meal. Delicious and simple - my kind of dish. I've never had this before, actually, but it looks great. Excellent food for any time ! As a bachelor of many years,I have trawled the net for recipes,and simply love your presentations of authentic marathi foods.Wonderful photos,wonderful presentation,great recipes,and its heart warming to see your passion for all that is tasty and palatable.Yumm !! Please keep up the good work and hope to see you soon with a more such special A-Z food fiestas. Tried out the recipe. Yummy! My all time comfort food. My favourite combination is Varan Bhat and French fries with chili and salt. This is the food I never get bored with. Waran bhat mith tup limbu:).